When Mazda updated mazdausa.com, they called upon RACER Studio to redesign the Mazda Motorsports website to fall in line with the updated look. While each serves different needs and audiences, the experience between the two had to feel as connected as possible. RACER Studio undertook a site wide audit of Mazda Motorsports website and restructured all of the content and navigation then designed a new site in keeping with Mazda's new brand guidelines. Once the site launched in February of 2017, RACER Studio began providing a stream of original feature content five days a week as well as manage the contact data base with a teaser for all new content. 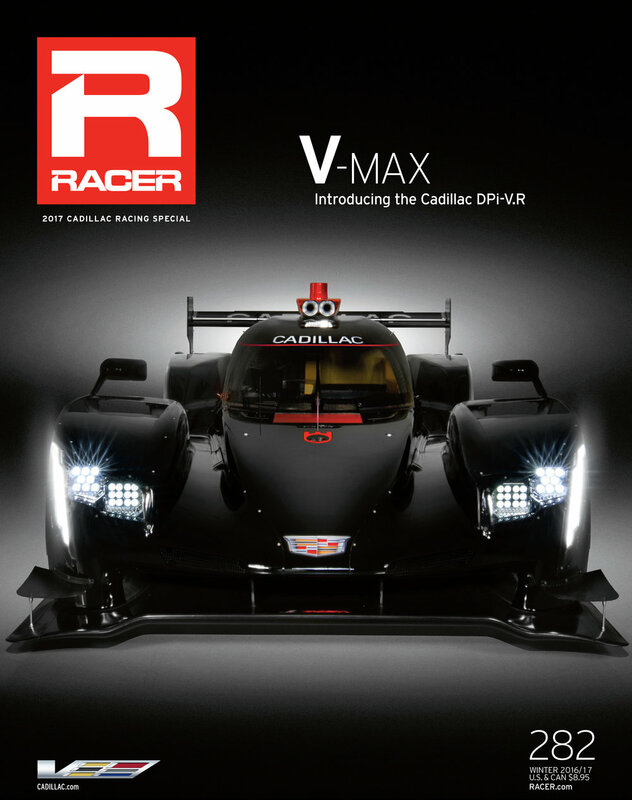 When Cadillac returned to endurance sports car racing with the new Cadillac DPi in the IMSA WeatherTech SportsCar Championship, they asked RACER Studio to produce a 16-page special section with unique cover for the December 2016 issue of RACER. Along with a custom studio pictorial of the new racecar, the special section included interviews with Cadillac executive and the leading figures who played a role in the car's development. In addition, there included a technical overview of the new DPi plus a look back at Cadillac's previous endurance racing foray and we learned how the company connects its motorsports activities to the everyday Cadillac driving experience. For each year from 2015 to 2017, IndyCar has commissioned RACER to create a 68-page special issue. The print version is distributed along with the “Heroes Issue” of RACER magazine in addition to 10,000 copies distributed directly by IndyCar. A digital version extended IndyCar’s ability to reach up to a million additional impressions through databases that include teams, stakeholders and commercial partners. Produced within an expedited timeframe of four weeks, the issue finishes just a week before the first race to ensure the most up-to-date and complete preview of the season. Included are driver and team bios, plus features on key players for that season. Special attention is paid to keeping content in a voice in-depth enough to satisfy the knowledgeable reader while also educating the casual fan or new audience member, many of whom are among the series valuable commercial partners. 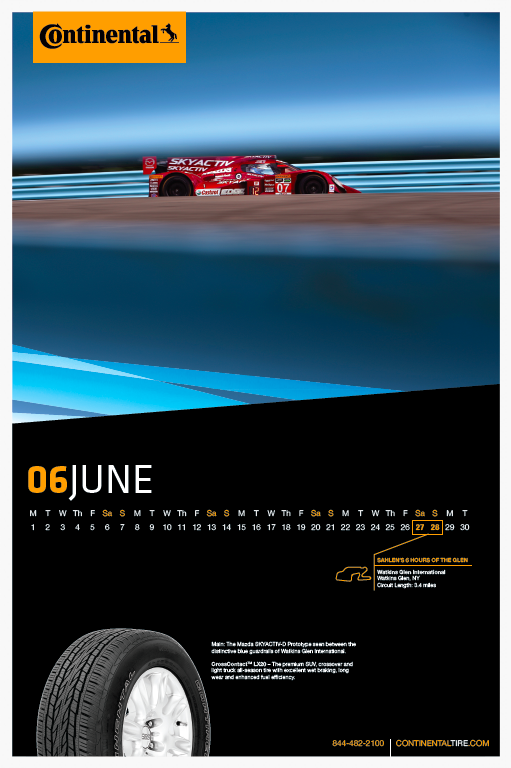 With access to many of North America's leading motorsports photographers, Continental Tire asked RACER Studio to create a 2015 calendar celebrating their extensive involvement with both the TUDOR United SportsCar Championship and the Continental Tire SportsCar Challenge. The calendar was distributed to Continental Tire retailers across the country and was included as a special gift to RACER readers with the final issue of 2014. This Chevrolet-sponsored bonus issue tells the story of Chevrolet’s racing season in RACER’s own independent and respected editorial voice. The issue was distributed on the newsstand and to RACER’s entire readership. Print and digital copies were distributed to GM executives around the world. This special issue was produced in both 2013 and 3014. RACETIME was created by the RACER editorial team for Tudor watches. It traces the history of sports car racing in America and celebrates the beginning of the TUDOR United Sports Car Championship. RACETIME was polybagged with the May 2014, 22nd Anniversary issue of RACER. It was distributed on the newsstand and to RACER’s entire readership. The publication was also distributed to Tudor retailers as collateral and by the sanctioning body to VIP guests. This SRT-sponsored bonus issue tells the story of SRT’s exciting track and street cars in RACER’s independent editorial voice. The issue was distributed on the newsstand and to RACER’s entire readership. This issue was also distributed to SRT dealers and VIPs. Our team has published SportsCar magazine for the Sports Car Club of America since the January 1984 issue. For more than 30 years we have served the diverse needs of the SCCA’s 45,000+ members with a product that has always been delivered on time and on budget. We have works tirelessly with SCCA over the years to keep evolving SportsCar into a magazine that remains relevant and important to the club’s members. RACER's most iconic feature is it's race car studio photography. MAZDA sponsored this photo shoot to tell the story of its clean-diesel technology in RACER’s respected editorial environment. A Mazda-customized version of this issue was produced for distribution to Mazda associates. After an absence of more than a decade, Bentley Motors is competing again on the racing circuits of North America. This seven episode video series tells the story of the Bentley Continental GT3's inaugural Pirelli World Challenge season with Dyson Racing Team Bentley. This video series was produced by RACER Studio and directed and edited by Jim Perry. This is Episode 2 of a five-part documentary series produced for Jaguar about the company's return to racing in 2010. This video series was created in collaboration with director Rick Graves and editor Andrew Snider. This is Episode 6 of Rev, the 30-episode series produced for Mazda. The series is about what it's like to be a professional race car driver and the challenges young drivers face in working their way up the ladder. This video series was created in collaboration with director Rick Graves, editor Andrew Snider and associate producer Jeremy Shaw. The Tesla Model S was introduced to the public at this event in New York City. We were hired by Tesla to produce the very first video footage of the Model S as part of the groundbreaking electric car’s launch campaign. This was the third installment of a three-part video series produced to document the development and launch of the car. This video series was created in collaboration with director Rick Graves and editor Andrew Snider. This is the first episode of the three-part series we were hired to produce about the launch of the Tesla Model S. In this installment, designer Franz von Holzhausen and Tesla Motors CEO Elon Musk talk about development of the Tesla Model S. This video series was created in collaboration with director Rick Graves and editor Andrew Snider.